References about students who are affected by Word Finding difficulties are also presented. Children with learning disabilities often have Word Finding difficulties, according to both research (German, 1979, 1984; Lewis & Kass, 1982) and clinical reports (Johnson & Myklebust, 1967). German (1998) studied 146 fourth and fifth-grade students with learning disabilities. Her studies showed that 72 students (49.4 percent) had either or both inaccurate and slow retrieval on the Test of Word Finding (TWF). Behavioral descriptions of students with learning disabilities typically mention the presence of Word Finding problems. Lerner (2000) observed that many students with learning disabilities retrieve words slowly, and Word Finding problems can be lifelong sources of difficulty in reading, learning, and expressive language. Smith (1991) states that students with learning disabilities and Word Finding difficulties have difficulty retrieving object names, numbers, and letter names or sounds of letters in school. Children make these kinds of errors even though they have full knowledge of the letter names and sounds they are trying to recall. Lexical retrieval may be important in understanding how students respond to instruction in phonemic awareness (Torgesen, Wagner & Rashotte, 1994; and Blachman, 1994). A "double deficit subtype" exists among students with reading disorders in which naming-speed deficits and phonological deficits co-occur (Wolf & Bowers, 1997). Phonological retrieval deficits co-occur with reading disorders (Catts & Kamhi, 1999). Poor readers display subtle oral language difficulties of which a Word Finding difficulty is one symptom (Murphy, Pollatsek & Well, 1998). The use of reading strategies by adolescents with dyslexia and typical matched readers suggest that dyslexic readers have impaired access to words in the lexicon. Students with dyslexia and poor readers are slow and inaccurate namers on tests of rapid automatic naming (Catts, 1989; Katz, 1986; Snowling, Wagtendonk & Stafford, 1988; Wagner, Torgeson & Rashotte, 1994; Wolf, 1980, 1986, 1991). Learner's with Word Finding difficulties often produce Word Finding based oral reading errors (German and Newman, 2005; Johnson and Myklebust, 1967). manifest error types related to their pattern of language deficit (Lahey & Edwards, 1999). manifest unique Word Finding behaviors, or both (German, 1987; German & Simon,1991). Further variation in using grammatical rules has been found in children with SLI (Bishop, 1994; Leonard, Bortolini, Caselli, McGregor, & Sabbadini,1992; Masterson & Kamhi, 1992; Panagos & Prelock,1982; Scott, 1994). The source of these grammatical errors might be either storage or retrieval difficulties. However, because variability in using correct verbal forms may suggest underlying competence for those forms (Bishop, 1994), authors have speculated that some students who manifest morphosyntactic difficulties may have underlying access or retrieval difficulties (Connell & Stone, 1992; Paul,1992; Rice & Bode, 1993; Scott,1994). The relationship between Word Finding skills and fluency difficulties, particularly stuttering, has been examined. In general, research and clinical reports have reported contrasting results suggesting that some, but not all, children who have fluency difficulties may have weak Word Finding skills (Boysen & Cullinan, 1971; P. Johnson, 1991; MacDonald & Beale, 1989; Moore, Craven & Farber, 1982; Telser, 1971; Telser & Rutherford, 1970; Weuffen, 1961). It appears that this is an area where more assessment and observation is needed to help clarify the relationship between Word Finding skills and fluency difficulties. Dennis (1992) reported that the Word Finding skills of children with hydrocephalus arising from aberrant brain development in the first year of life are affected, although not equally impaired. Children and adolescents with acquired traumatic head injury have been reported to show impairment in object description and naming fluency tests (Ewing-Cobbs, Fletcher, Landry, & Levin, 1985). Dennis (1992) reports that even mild injuries may produce Word Finding difficulties serious enough to affect academic learning. That is, several years after the trauma, those students with poor discourse skills manifested Word Finding difficulties in conversational discourse due to their difficulties in accessing information from long term memory). Dennis (1980) also observed profound Word Finding difficulties in single word and discourse contexts in a child who had a sustained stroke. Riccio and Hynd (1993) report that there is a high incidence of language difficulties in children referred to clinics as a result of behavioral difficulties. Conversely, the most frequent psychiatric disorder associated with speech and language difficulties has been reported to be attention-deficit/hyperactivity disorder (ADHD) (Love & Thompson, 1988). Although authors have hypothesized as to the connection between these language and behavioral difficulties, their relationship is still unclear (Baker and Cantwell, 1987). The most common language problems reported in students with ADHD are weaknesses in auditory comprehension and language processing (Baker & Cantwell,1990), but little is reported as to their Word Finding skills. It appears that this is also an area where more assessment is needed in the area of Word Finding to help clarify the nature of these students' language difficulties. Ackerman, P.T., Dykman, R.A., & Gardner, N.Y. (1990). Counting rate, naming rate, phonological sensitivity, and memory span: Major factors in dyslexia. Journal of Learning Disabilities, 23, 325-327. Aram, D. (1993). Brain injury and language impairment in childhood. In P. Fletcher & D. Hall (Eds. 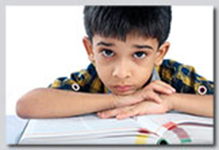 ), Specific speech and language disorders in children. (pp. 80-93). San Diego, CA: Singular Publishing Group. Aram, D., Ekelman, B.M & Whitaker, H. (1987). Lexical retrieval in left and right brain lesioned children. Brain and Language, 31, 61-87. Baker, L., & Cantwell, D.P. (1987). Comparison of well, emotionally disordered and behaviorally disordered children with linguistic problems. Journal of American Academy of Child and Adolescent Psychiatry, 26, 193-196. Baker, L., & Cantwell, D.P. (1990). The association between emotional/behavioral disorders and learning disorders in children with speech/language disorders. Advances in Learning and Behavioral Disabilities, 6, 27-46. Bishop, D., (1994). Grammatical errors in specific language impairment: Competence or performance limitations? Applied Psycholinguistics, 15, 507-550. Blachman, B.A. (1994). What we have learned from longitudinal studies of phonological processing and reading, and some unanswered questions: A response to Torgesen, Wagner, and Rashotte. Journal of Learning Disabilities, 27, 287-291. Bowers, P.G; Swanson, L.B. (1991). Naming speed deficits in reading disability: Multiple measures of a singular process. Journal of Experimental Child Psychology, 51, 195-219. Boysen, A., and Cullinan, W. (1971). Object-naming latency in stuttering and nonstuttering children. Journal of Speech and Hearing Research, 14, 728-738. Campbell, T. F., & Dollagham, C. A., (1990). Expressive language recovery in severely brain-injured children and adolescents. Journal of Speech and Hearing Disorders, 55, 567-581. Catts, H. (1986). Speech production/phonological deficits in reading-disordered children. Journal of Learning Disabilities, 19, 504-508. Catts, H. (1989). Phonological processing deficits and reading disabilities. In A. G. Kamhi & H. W. Catts (Eds. ), Reading disabilities: A developmental language perceptive (pp. 101-132). Boston: Allyn & Bacon. Catts, H. & Kamhi, A. (1999). Causes of reading difficulties. In H. W. Catts and A. G. Kamhi & (Eds. ), Language and reading disabilities (pp. 95-127). Boston: Allyn & Bacon. Connel, P., & Stone, C. (1992). Morpheme learning of children with specific language impairment under controlled instructional conditions. Journal of Speech and Hearing Research, 35, 844-852. Denckla, M. B., & Rudel, R. G. (1976a). Naming of object drawing by dyslexic and other learning disabled children. Brain and Language, 3, 1-15. Denckla, M. B., & Rudel, R. G. (1976b). Rapid automatized naming (RAN): Dyslexic differentiated from other learning disabilities. Neuropsychologia,14, 471-479. Dennis, M. (1980). Language acquistion in a single hemisphere: Semanic organization. In D. Caplan (Ed. ), Biological studies of mental processes (pp. 159-185). Cambridge. MA: MIT Press. Dennis, M. (1992). Word finding in children and adolescents with a history of brain injury. Topics in Language Disorders, 13, 66-82. Dennis, M., Hendrick, E. B., Hoffman, H. J., & Humphreys, R. P. (1987). Language of hydrocephalic children and adolescents. Journal of Clinical and Experimental Neuropsychology, 9, 593-621. Elbro, C. (1991). Differences in reading strategies reflect differences in linguistic abilities. International Journal of Applied Linguistics, 1 (2), 228-244. Ewing-Cobbs, L., Fletcher, J. M., Landry, S. H., & Levin, H. S. (1985). Language disorders after pediatric head injury. In J. Darby (Ed. ), Speech and language evaluation in neurology: Children and adolescents. (pp. 71-89). San Diego: Grune & Stratton. Faust, M., Dimitrovsky, L., & Davidi, S. (1997) Naming difficulties in language disabled children: Preliminary findings with the application of tip-of-the tongue paradigm. Journal of Speech and Hearing Research, 40, 1026-1036. Fletcher, P. (1992). Sub-groups in school-age language-impaired children. In P. Fletcher & D. Hall (Eds. ), Specific speech and language disorders in children (pp. 152-163). San Diego: Singular. Fried-Oken, M. (1984). The development of naming skills in normal and language deficient children. Unpublished doctoral dissertation, Boston University, Boston. German, D. J. (1979). Word finding skills in children with learning disabilities. Journal of Learning Disabilities, 12, 43-48. German, D. J. (1982). Word-finding substitutions in children with learning disabilities. Journal of Language, Speech, and Hearing Services in Schools, 13, 223-230. German, D. J. (1984). Diagnosis of word-finding disorders in children with learning disabilities. Journal of Learning Disabilities, 17, 353-358. German, D. J. (1987). Spontaneous language profiles of children with word-finding problems. Language, Speech, and Hearing Services in Schools, 18, 217-230. German, D. J. (1995). Response substitutions of students with learning disabilities and specific word-finding profiles. Unpublished Manuscript. German, D. J. (1998, February). Prevalence estimates for Word Finding difficulties in students with learning disabilities : Implications for assessment /instructional accommodations. Poster session presented at the annual meeting of the Learning Disability Association of America. Washington, DC. German, D. J. (2000a,October). Formulate a second hypothesis: Word finding based oral reading errors. Presentation at the Illinois Dyslexia Association, Oak Park, IL. German, D. J. (2000b, November). Word finding (WF) sensitive oral reading (OR) analysis. Poster presented at the American Speech, Language, and Hearing Association ASHA, Washington, DC. German, D. J. & Gellar, M. (2001, November). The effect of word-finding difficulties on oral reading assessment, preliminary investigation. Poster presented at the International Dyslexia Association (IDA), New Mexico. German, D. J. & Newman, R.S. (2005, July) Word Finding Based Oral Reading Errors, Paper presented at the International Congress of the Study of Child Language (ICSAL), Berlin, Germany. German, D. J., & Simon, E. (1991). Analysis of children's Word Finding skills in discourse. Journal of Speech and Hearing Research, 34, 309-316. Johnson, D., & Myklebust, H. (1967). Learning disabilities: Educational principles and practices. New York: Grune & Stratton. Johnson, P. (1991, November). Word-finding ability in preschool stuttering and non-stuttering children. Paper presented at the meeting of the American Speech-Language-Hearing Association. Atlanta. Kail, R., Hale, C. A., Leonard, L. B., & Nippold, M. A. (1984). Lexical storage and retrieval in language impaired children. Applied Psycholinguistics, 5, 37-49. Katz, R. B. (1986). Phonological deficiencies in children with reading disabilities: Evidence from an object-naming task. Cognition, 22, 225-257. Katz, W., Curtiss, S., & Tallal, P. (1992) . Rapid automatized naming and gesture by normal and language impaired children. Brain and Language, 43, 623-641. Lahey, M., & Edwards, J. (1996). Why do children with specific language impairment name pictures more slowly than their peers? Journal of Speech and Hearing Research, 39(5), 1081-1097. Lahey, M., & Edwards, J. (1999). Naming errors of children with specific language impairment. Journal of Speech and Hearing Research, 42(1), 195-205. Larrivee, L.S., & Catts, H.W. (1999). Early reading achievement in children with expressive phonological disorders. American Journal of Speech-Language Pathology, 8(2), 118-128. Leonard, L., Bortolini, U., Caselli, M.C., McGregor, K., & Sabbadini, L. (1992). Morphological deficits in children with specific language impairment: The status of features in the underlying grammar. Language Acquisition, 2, 151-179. Leonard, L., Nippold, M., Kail, R., & Hale, C. (1983). Picture naming in language-impaired children. Journal of Speech and Hearing Research, 26, 609-615. Lerner, J. (2000). Learning disabilities: Theories, diagnosis, and teaching strategies (8th ed.). Boston: Houghton Mifflin. Lewis, R. B., & Kass, C. E. (1982). Labeling and recall in learning disabled students. Journal of Learning Disabilities, 15(4), 238-241. Love, A. J., & Thompson, M.D. (1988). Language disorders and attention deficit disorders in young children referred for psychiatric services: Analysis of prevalence and a conceptual synthesis. American Journal of Orthopsychiatry, 58, 52-64. MacDonald, A., & Beale, C. (1989, November). Word-finding abilities of stutters and nonstutters. Paper presented at the meeting of the American Speech-Language-Hearing Association, St. Louis. Manis, F.R., Doi, L.M., Bhadha, B. (2000). Naming speed, phonological awareness, and orthographic knowledge in second graders. Journal of Learning Disabilities, 33(4), 325-333. Masterson, J., & Kamhi, A. (1992). Linguistic trade-offs in school-age children with and without language disorders. Journal of Speech and Hearing Research, 35, 1064-1075. McBride-Chang, C., Franklin, R.(1996) Structural invariance in the associations of naming speed, phonological awareness, and verbal reasoning in good and poor readers: A test of the double deficit hypothesis. Reading and Writing : An Interdisciplinary Journal, 88(4), 323-339. McGregor, K. K. (1997). The nature of word-finding errors of preschoolers with and without word-finding deficits. Journal of Speech and Hearing Research, 40, 1232-1244. McGregor K. K., & Waxman S. R. (1998). Object Naming at Multiple Hierarchical Levels: A Comparison of preschoolers with and without word-finding deficits. Journal of Child Language, 25, 419-430. Messer, D., Murphy, N., & Dockrell, J.E. (2004). The relationship between naming and literacy in children with word-finding difficulties. Journal of Educational Psychology, 96, 462-470. Moore, W. H. Jr., Craven, D. C., & Farber, M. M. (1982). Hemispheric alpha asymmetries of words with positive, negative, and neutral arousal values preceding tasks of recall and recognition: Electrophysiological and behavioral results from stuttering males and nonstuttering males and females. Brain and Language, 17, 211-224. Murphy, L. A., Pollatsek, A., & Well, A. D. (1988). Developmental dyslexia and word retrieval deficits. Brain and Language, 35, 1-23. Paul, R. (1992). Speech language interactions in the talk of young children. In R. Chapman (Ed. ), Processing in language acquisition and disorders (pp. 235-254). St. Louis, MO: Mosby. Riccio, C.A., & Hynd, G.W. (1993). Developmental language disorders in children: Relationship with learning disabilities and attention deficit hyperactivity disorder. School Psychology Review, 22(4) 698-709. Rice, M., & Bode, J. (1993). Gaps in the lexicon of children with specific language impairment. First Language, 13, 113-131. Roth, F.P., Speece, D.L., & Cooper, D.H. (2002). A longitudinal analysis of the connection between oral language and early reading. The Journal of Education Research, 95, 259-272. Rubin, H., Bernstein, S., & Katz, R. B. (1989). Effects of cues on object naming in first grade good and poor readers. Annals of Dyslexia, 39, 116-124. Rubin, H., & Liberman, I. (1983). Exploring the oral and written language errors made by language disabled children. Annals of Dyslexia, 33, 110-120. Schwartz, E., & Solot, C. (1980). Response patterns characteristic of verbal expressive disorders. Language, Speech, and Hearing Services in Schools, 11, 139-144. Scott, C.,(1994). Syntax for school-age children: A discourse perspective. In M.E. Fey, J. Windsor, & S.F. Warren (Eds. ), Language intervention: Preschool through the elementary years (pp. 107-143). Baltimore: Brooks. Segal, D., & Wolf, M. (1993). Automaticity, word-retrieval, and vocabulary development in reading disabled children. In L. Meltzer (Ed. ), Strategy assessment and instruction for students with learning disabilities: From theory to practice (pp. 141-165). Austin, TX: PRO-ED. Shaywitz, S. (2003). Overcoming Dyslexia: A new and complete science-based program for reading problems at any level. NYC: Alfred A. Knopf. Smith, C. R. (1991). Learning disabilities: The interaction of learner, task, and setting. Boston: Allyn & Bacon. Snowling, M., Wagtendonk, B., & Stafford, C. (1988). Object-naming deficits in developmental dyslexia. Journal of Research in Reading, 11, 67-85. Snyder, L.S., & Downey, D.M. (1995). Serial rapid naming skills in children with reading disabilities. Annals of Dyslexia, 45, 31-49. Telser, E. (1971). An assessment of word-finding skills in stuttering and non-stuttering children. Unpublished doctoral dissertation. Northwestern University, Evanston, IL. Telser, E. B., & Rutherford, D. R. (1970, November). Word-finding abilities of stuttering and non-stuttering children. Paper presented at the meeting of the American Speech and Hearing Association, New York. Wagner, R., Torgesen, J., & Rashotte, C. (1994). Development of reading-related phonological processing abilities: New evidence of bidirectional causality from a latent variable longitudinal study. Developmental Psychology, 30, 73-87. Weuffen, N. (1961). Testing Word Finding in normal and stuttering children. Folia Phoniatrica, 13, 267. Wiegel-Crump, C., & Dennis, M. D. (1986). Development of Word Finding. Brain and Language, 27, 1-23. Wimmer, H., (1993). Characteristics of developmental dyslexia in a regular writing system. Applied Psycholinguistics, 14(1), 1-33. Wolf, M. (1980). The word-retrieval process and reading in children and aphasics. Children's Language, 3, 437-490. Wolf, M. (1982). The word retrieval process and reading in children and aphasics, In K. Nelson (ed. ), Children's Language, Vol. 3. New York: Gardner Press. Wolf, M. (1986). Rapid alternating stimulus naming in the developmental dyslexias. Brain and Language, 27, 360-379. Wolf, M. (1991). The word retrieval deficit hypothesis and developmental dyslexia . Learning and Individual Differences, 3, 205-223. Wolf, M., & Bowers, P. (1997). The Double-Deficit Hypothesis for the developmental dyslexias. Unpublished paper, submitted for publication. Wolf, M., & Bowers, P. (2000). Naming-speed deficits in developmental reading disabilities: An introduction to the special series on the double-deficit hypothesis. Journal of Learning Disabilities, 33(4), 322-324. Wolf, M., & Bowers, P., Biddle, K. (2000). Naming-speed processes, timing, and reading: A conceptual review. Journal of Learning Disabilities, 33(4), 387-407. Wolf, M., & Obregon, M. (1992). Early naming deficits, developmental dyslexia, and a specific deficit hypothesis. Brain and Language, 42, 219-247. Wolf, M. & Segal, D. (1992). Word finding and reading in the developmental dyslexias. Topic in Language Disorders, 13 (1), 51-65. "Usually...no, it's useful...no, it's useless! I really knew the word was'useless' from the beginning .I looked at it and knew what it was, but my mouth read the other two words first. It is so frustrating."